I can now cross riding an elephant off of my bucket list. Not that it was ever on my bucket list, but it’s been accomplished. 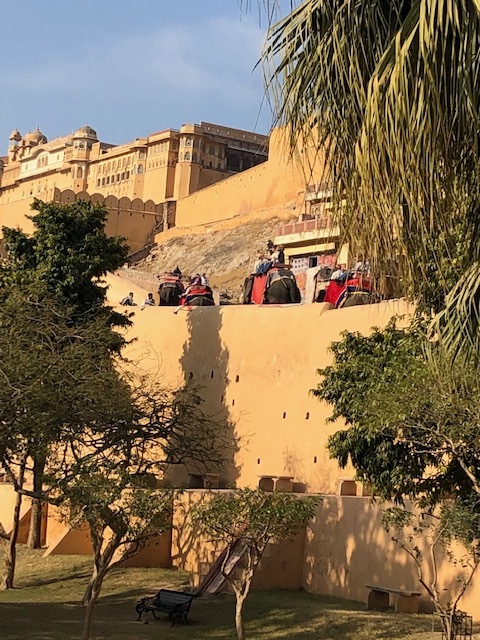 A row of elephants heads up to the Amer Fort at the top of the hill. 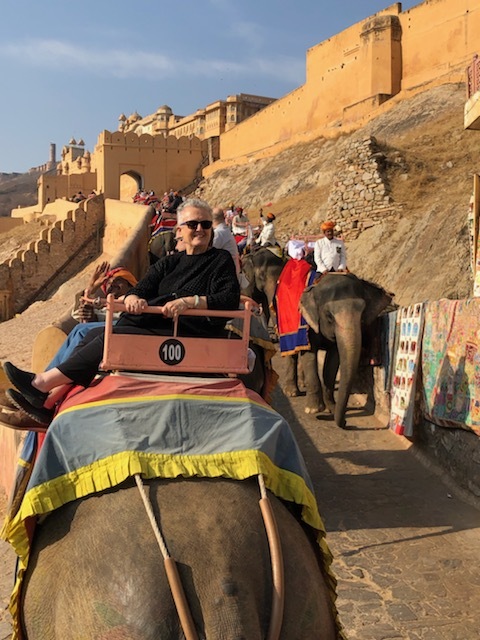 Elephants are one of two ways to get up the front of the hill to the Amer Fort outside of Jaipur – the other is walking, and it’s a very l-o-n-g walk (cars can go around the back, but it’s a traffic nightmare there). However, the elephants are only available in the morning, and under the law they are only allowed to make four round trips up and back. The ride up takes about 15-20 minutes, and rather than feeling bumpy it was more of a rolling ride, from side to side, or in our case because we were sitting to the side, front to back. Our elephant was a rescue, and was 32 years old – if you said “good morning” she would call back! A few times thought it felt as if I was going to be tossed right off over the wall and down the cliff, very scary if you’re afraid of heights like I am. But in the end I survived, had a good ride, and have another story to tell my grandchildren. 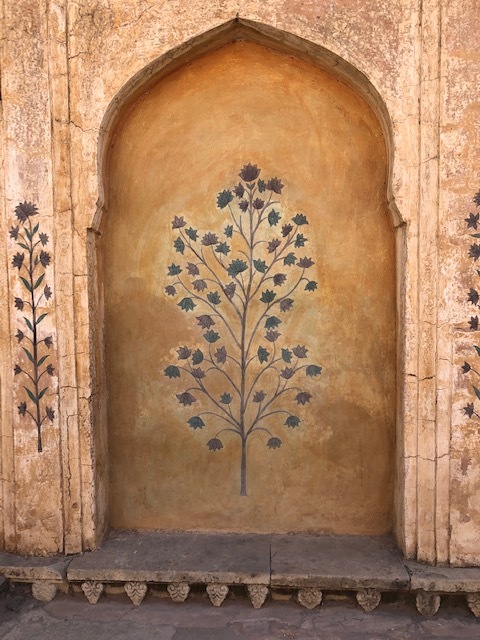 The Amer fort was another site where the outside walls gave no indication of the splendors inside. 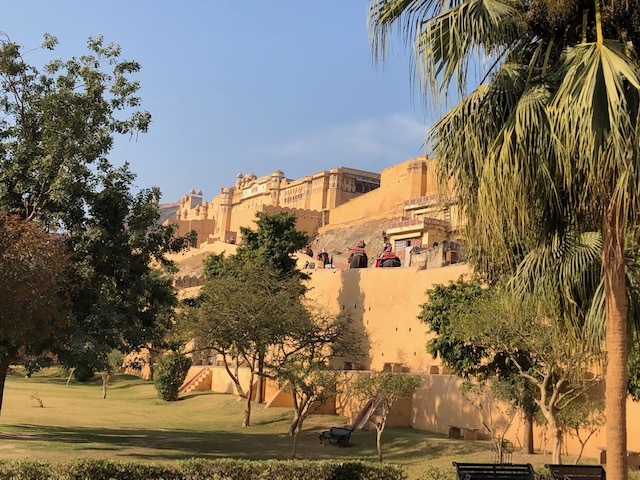 Built in 1592 the fort contains the Amber Palace, which is divided into three parts, and filled with beautiful carvings and paintings. 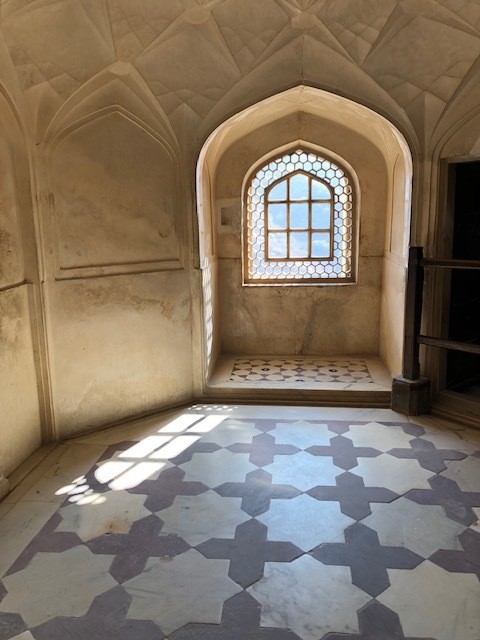 The palace itself is divided into three sections: one for the maharaja, one for his primary wife, and one for the maharaja’s concubines and dancing women. The changing room for the Turkish bath in the palace, made from marble. This was one area shared by men and women (although not at the same time). An example of the decoration in the Glass Palace, created from marble and mirrored glass. Small, full mirrors were set where the walls met allowing you to see the splendor of entire room (or get a picture of yourself). Paintings in the concubine and dancing women’s section of the palace were not as opulent, but still vibrant and beautiful. Our elephants arrived in the huge grand courtyard outside the maharaja’s and men’s section of the fort. From there we entered an ornately painted gateway into the primary wife’s palace, which was made from white marble and opulently decorated. One section of her palace was known as the “Glass Palace” because all the walls and ceilings are decorated with mirrored glass, either as full mirrors or small bits of mosaic tile. The rooms were exquisitely beautiful, and it was easy to imagine how they must have sparkled from the lights at night. The third section of the palace, although not as opulent as the primary wife’s quarters, still contained beautiful paintings, and the women who lived in this section apparently each had their own room. There were vendors and hawkers everywhere around the palace. 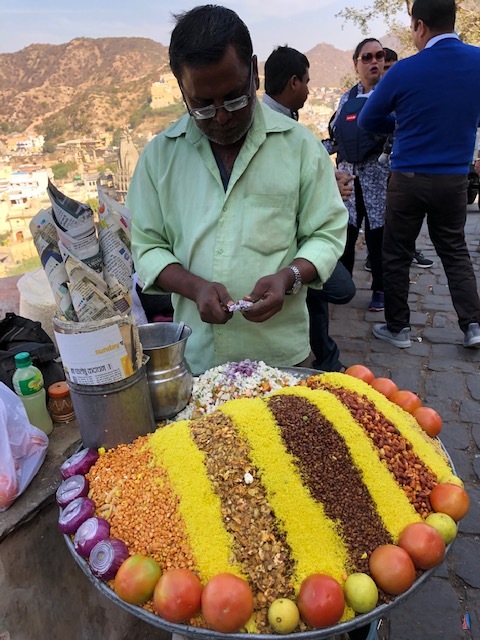 This man was selling curried lentils and rice which he prepared with fresh tomatoes, onions and lime juice. We left the palace and fort and walked about halfway down the hill where a jeep picked us up to take us the rest of the way down to our van. 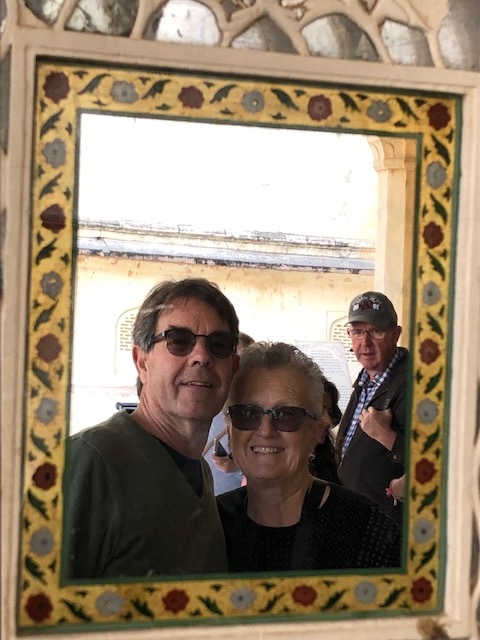 We then set off on a long drive through the countryside to our lunch destination: Samode palace, former home of members of the local royal family. The area seemed mostly dry and dusty (the hills reminded me of the ones in eastern San Diego county), but as we got nearer to the palace more and more green fields appeared, filled with rice, wheat or leafy green vegetables. We learned the royal family still owns a great deal of farm land in the area. 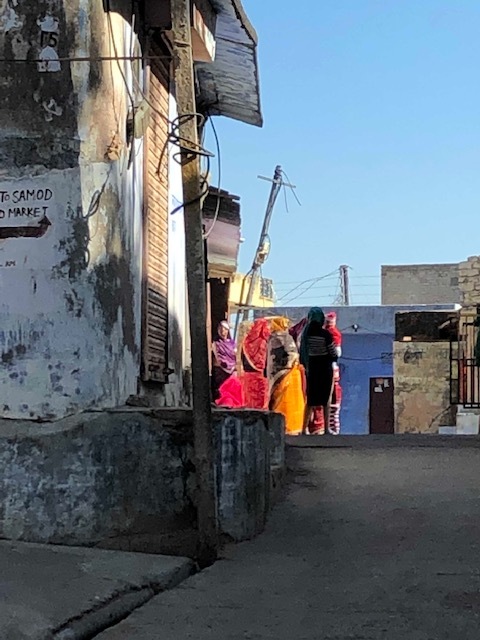 Women in colorful saris gather to gossip in the old village outside of the royal palace. The palace was like a little hidden gem in the countryside, accessed through an old village. A few members of the royal family still live in the palace, but these days it operates as a boutique hotel and a popular wedding site. It is also sometimes used as a setting in Bollywood films. The palace’s restaurant is renowned and we enjoyed a wonderful buffet lunch in a dining room dripping with giant chandeliers and decorated in gold. Afterwards we toured the palace grounds and were able to watch a bit as they were transformed for a wedding taking place that evening. 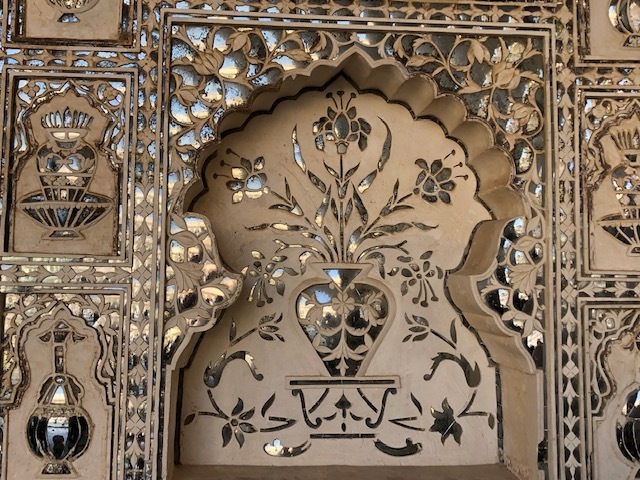 The palace was a long drive outside of Jaipur, but we made good time on our way back and headed for our last stop of the day: A Rajasthani textile center. We were again met with cool drinks, and shown a variety of beautiful rugs, much more varied than the ones we had seen the other day. The prices were also better as well. Amy and Phil bought another small rug, but I was more interested in seeing the textiles upstairs. My beautiful Rajasthani wool jacket! And then it was back to our hotel to relax and get ready for our last day in India. After checking out from our wonderful hotel this morning we will be visiting a monument and the “monkey temple” complex, a Hindu pilgrimage site, followed by lunch. Afterwards we will all head over to the Jaipur airport for our return to Delhi (Amy and Phil will be flying with Luke to Mumbai) where we’ll catch our late-night flight to Hong Kong. I almost cannot believe our wonderful tour will be ending today – it’s been the experience of a lifetime! Your coat is beautiful. Very flattering. How long will you be staying in Hong Kong? I love the jacket too, although it will look better with nicer pants and shoes. I love my ring too – it was a wonderful surprise! That jacket is beautiful. Great choice in color and perfect fit. The ring was also lovely. Simple is best for me as well. Hard to believe the tour is almost over. Looks like it was a great bite sized tour the guides make all the difference sometimes. Have a good next flight! I’m so happy to hear that the elephants are regulated in their work, and that they have rescues. And your coat is magnificent! Oh, that jacket! Just beautiful! The tour has been so interesting, and your descriptions and pictures are just wonderful. 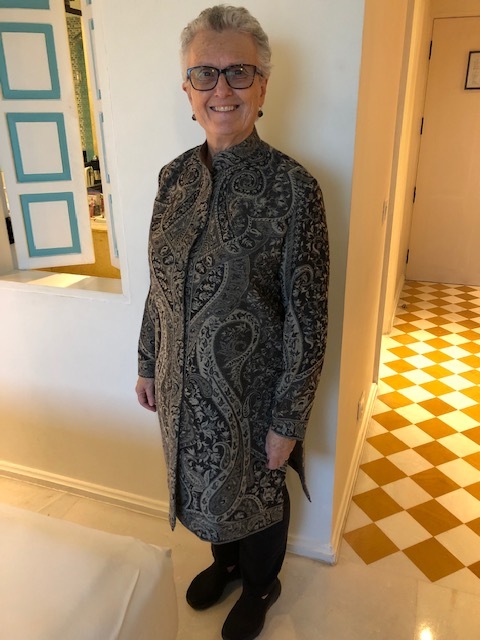 I really am in love with that jacket, but need to wear it with some more stylish pants and shoes than the ones I am wearing in the picture. It was a totally unexpected find. I took a LOT of pictures in India, but only have room in the blog for a few. One of my tasks at the end of each day was to go through them all and get rid of the extras or “bad” ones. There were always a few that had me wondering what I was looking at, and why I took the picture. I guess it made sense at the time, but not later! ,,,but that jacket!!! I LOVED that it ‘sparked joy’ 🙂 Certainly a major souvenir that you will love for some time!!! THAT was the moment I really, really understood what “spark joy” meant! 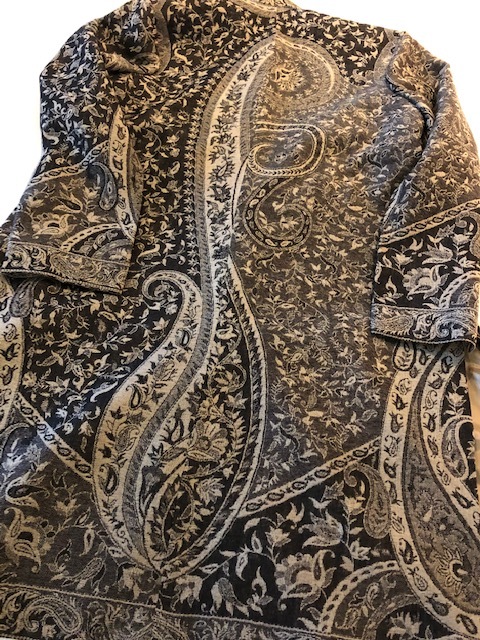 I am actually thinking of wearing it today when we go to tea at the Peninsula Hotel – we’ll see.